i won’t bring it up. i won’t offer my memories. i will help count out the number of days on the calendar. i will say it is “september 11, 2012” and i will remember what it was like to be 7 months pregnant in that exact classroom 11 years ago. then we will paint. with every color available in paint and all colors that could possibly be mixed. 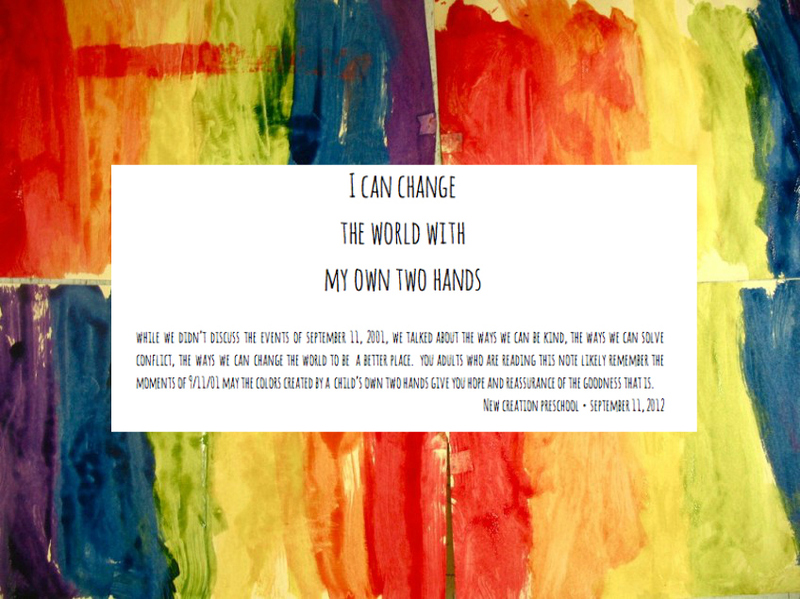 we’ll use brushes and we’ll use hands. we’ll listen to music and celebrate the freedom of childhood that is captured in our classroom. I can’t hear the numbers “nine” and “eleven” in consecutive order without feeling a subtle stomach lurch and heart race. but those are my feelings and not necessarily anyone else’s, especially the humans who are a mere few years on this earth. it’s another opportunity to consider our role as teachers, to be available and guide. so in honor of tomorrow’s date, I offer these thoughts from a couple of years ago. This is seriously amazing! So helpful! Thank you! Thank you for the quiet reassurance-sending hope & blessings to us all! I love this. 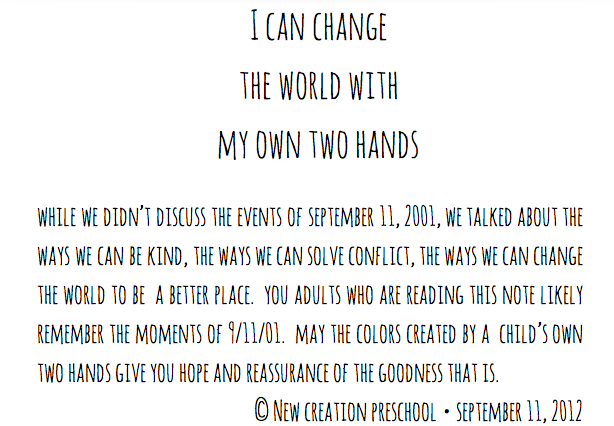 What a great way to teach young preschool students who are too young to understand and know the events of 9/11. Adults know and were greatly affected by those tragic events. Thanks for sharing. I might just use this in my classroom tomorrow. I love this and plan to use it in my classroom tomorrow. Thank you so much for this! Very inspiring. I love Ben Harper’s song. You are so inspiring. Truly remarkable. Awesome! Can’t do better than this!